Gouda Cheese Shop is a great choice for you if you prefer to buy cheese sliced and vacuum sealed. We even offer the possibility to order sliced cheeses online via our online shop, which makes buying cheese very easy and convenient. There is no longer any need to visit a shop in order to have freshly sliced cheese at home, as it we will deliver it to your front door. Our online shop does not only offer different varieties of cheese, but we also offer a range of different options regarding weight and the number of slices which ensures that there is an always an option available to suit your needs. A student will find their requirements met by a small pack containing 4 slices between 85 to 95 grams, whereas a pack weighing between 300 to 400 grams will be much more suited to a large family. We slice our cheeses in a variety of sizes and quantities in order to make sure every customer can find an option that meets their needs. Please ask a member of our customer services team if you have trouble finding anything, as there is always someone available to assist you with finding what you need. Gouda Cheese Shop serves both businesses and private individuals, and for this reason we also have professional slicing equipment and knives in stock. If you’re running your own cheese shop or if you’re looking to slice cheese as part of your catering business, you’ll be delighted by our stock of cheese knives and slicing equipment. From traditional Dutch cheese knives to mezzalunas, we also have many items in stock which will enable you to create your own beautiful cheese boards. A miniature cheese slicer or cheese knife could feature as a lovely gift and would also be a great accompaniment to a cheese board when serving your guests. Do you prefer to slice cheeses yourself? Our online shop offers the cheese tools you need for sliced cheese. Gouda Cheese Shop is more than simply an online shop where you can buy competitively priced cheese products of great quality. Our customers can count on a customer-focussed service in our online cheese shop. Apart from quick delivery and low prices, our customers benefit from other perks, such the various ways with which you can contact our customer services team for help and advice. Our shop also offers useful cheese tools and sets in order to ensure that your cheese needs are fully met. Furthermore, we offer some lovely add-ons to our customers. 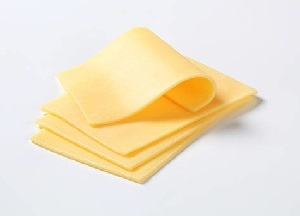 For instance, every customer receives free wrapping paper with every cheese order. Would you like to slice cheese with your very own quality cheese slicer? If you subscribe to our newsletter you will receive a beautiful cheese slicer from us, absolutely free.